Bona Naturale is the next generation of wood floor protection that preserves the true natural look of your hardwood floor. With Bona Naturale, you get as close to an untreated look and feel as possible while still providing your floor with a durable surface. Along with Bona Naturales elegant look and noticeably unique feeling underfoot, this finish also has superb durability.Traffic-like durability, and because of its natural look, scratch marks are less visible. For trained, experienced professional use only. 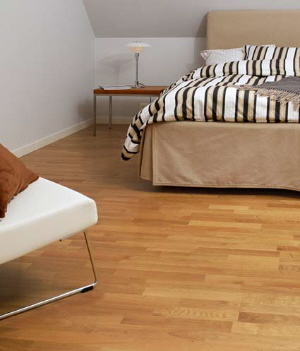 Oak floor with bona naturale clear finish. Bona Naturale water base wood floor coating. DIRECTIONS FOR USE: BEFORE USING, READ ALL DIRECTIONS AND MATERIAL SAFETY DATA SHEET #80350 FOR THIS PRODUCT AND #80355 FOR NATURALE HARDENER. For trained experienced professional use only. BONA NATURALE is part of the Bona Environmental Choice System which represents products and systems for each step of the hardwood floor finishing process. These products meet or exceed all state and federal clean air quality standards and reflect our commitment to personal health, indoor air quality and the environment. Nonflammable. Available in Commercial Matte. Do not thin. Call BonaKemi USA, Inc. before using for technical advice if needed (800) 872-5515. KEEP FROM FREEZING. DIRECTIONS FOR USE: RECOATING EXISTING FLOORS 1. Be sure floor is free from wax or oily residue. 2. Use Bona Prep system (see label for directions). 3. Apply 1-2 coats of Bona Naturale (see finish directions). NOTE: Naturale will adhere to most stains and finishes after proper preparation and dry times. Stain, sealer and finish results may vary widely depending on the wood species, especially on oily and resinous exotics. ALWAYS PREPARE A SAMPLE OR TEST AREA TO DETERMINE COMPATIBILITY AND DESIRED RESULTS. INTERCOAT ABRASION: Abrading between waterbased sealer and finish coats is not necessary for adhesion unless it has been more than 48 hours since the previous coat was applied. Abrade solvent-based sealer with a Bona Conditioning Pad before applying finish coats. For smoothest results, abrade all sealer coats with a Bona Conditioning Pad and 1-2 Delta Sheets to eliminate excess grain raise. Abrade prior to the final finish coat with just the Bona® Conditioning Pad. Always vacuum and tack thoroughly with a Bona® microfiber mop or cloth after abrading.